When he was in high school, Cory Booker, the New Jersey Democrat and possible White House contender, groped his classmate as they kissed. He reached for her breast, and when she swatted his hand away, he made another attempt. The incident resurfaced this week as Booker joined calls for an FBI investigation into the allegation of high-school-era sexual assault leveled by Christine Blasey Ford against Brett Kavanaugh, President Trump’s nominee to the Supreme Court. But the skeleton in Booker’s closet seized on by outlets such as Fox News and the Daily Caller wasn’t really in his closet. The senator himself chose years ago to air the issue, marking a notable contrast with instances in which accusations of impropriety burst forth as a result of media investigation or opposition research. In 1992, Booker, then a student at Stanford University, wrote a column for his college newspaper in which he recounted the groping and used his own behavior to underscore, in starkly personal terms, how his views had shifted on gender and sexual respect. He credited his work as a peer counselor with the transformation. 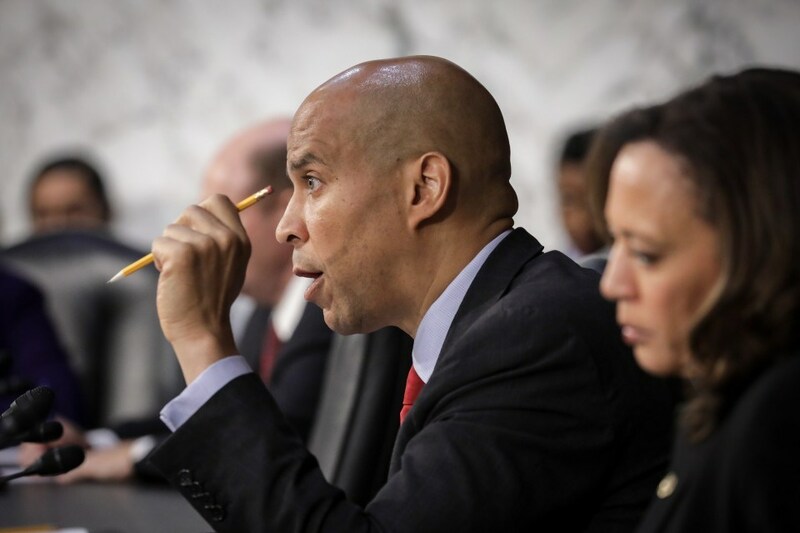 Whether it makes a difference if the “very drunk kid” owned up to the behavior is the question raised by Booker’s case, which is under a spotlight intensified by the senator’s own jockeying as he weighs a run for the presidency. He told New York Magazine in an interview published this week that it would be “irresponsible” not to consider running for president. Booker, who studied political science and sociology and played tight end for the college football team, wrote a regular column for the Stanford Daily. He often broached difficult subjects, from racial profiling to anti-gay prejudice, with the rhetorical flourish that would come to characterize his political speeches. He began with a personal story. “With the ‘Top Gun’ slogan ringing in my head, I slowly reached for her breast,” continued Booker, who grew up in Harrington Park, N.J., outside of Newark, where he was elected mayor in 2006. It’s unclear which movie slogan he meant. As a columnist in the Star-Ledger observed this week, the Tom Cruise action film didn’t come out until 1986. He said he didn’t enter a romantic relationship with his New Year’s Eve companion, though they began a friendship. When he first arrived at college, it was more of the same, Booker said. He enumerated statements fired off at the Palo Alto, Calif., campus, from the casually sexist to the alarmingly violent. He confessed to having no good conclusion for his column. “All I have are poignant visions,” he offered. “I see myself at 15 trotting around the bases and stealing second,” Booker wrote. The 1992 column was unearthed by the Daily Caller in 2013, when Booker was first running for Senate. The then-mayor didn’t comment on the episode, nor has he had much to say about it since. His conduct and his mea culpa were public knowledge when voters elected him in the 2013 special election and chose him again in 2014. “Looks like ‘Spartacus’ had roamin’ hands,” the column was headlined. Florida police, worried about crime stats, framed three black men for burglaries. One was deported because of it, suit says. Suge Knight helped create gangster rap. Now he’s facing up to 28 years for a 2015 fatal hit-and-run. Isaac Stanley-Becker is a reporter on The Washington Post's Morning Mix team.